"The Brief: Senate committee takes up bills regarding eminent domain" was first published by The Texas Tribune, a nonprofit, nonpartisan media organization that informs Texans — and engages with them — about public policy, politics, government and statewide issues. Editor's Note: If you'd like to get The Brief in your inbox every weekday, sign up here. In a hearing Monday, Texas lawmakers will weigh whether to proclaim fantasy sports are legal. This comes after Texas Attorney General Ken Paxton equated fantasy sports to illegal gambling. No Texas Democrat has won a U.S. Senate seat in nearly 30 years or any statewide office since 1994. But U.S. Rep. Beto O’Rourke is optimistic he can break the streak, in part by eschewing consultants, pollsters and PAC money. The Senate State Affairs Committee is taking up several bills Monday concerning eminent domain. Some of the legislation is aimed at providing landowners with more information about their rights and how the eminent domain process works. On Wednesday, the Senate Transportation Committee will take up bills concerning one of the state's most controversial projects that relies on eminent domain: a high-speed train that would whisk Texans between Houston and Dallas in 90 minutes. Texas Central — the private company behind the project — has played down concerns about land ownership. They said they don't plan to use eminent domain except as a last resort. The hearing begins at 9 a.m. Monday morning. Watch online here and follow Texas Tribune reporter Brandon Formby for updates. Texas lawmakers will weigh the legality of fantasy sports betting this afternoon. Watch online here and follow Texas Tribune reporter Alex Samuels for updates. The Texas Senate may take up legislation aimed at addressing the Dallas pensions crisis. Watch online here and follow Texas Tribune reporter Brandon Formby for updates. Tomorrow, join us in person or online for a conversation on higher education in Texas with state Sen. Kel Seliger and state Rep. J.M. Lozano. Later in the day, we'll talk about legislative issues with experienced community organizers at the W Austin Records Room. The event is part of the Tribune's On the Record series, geared towards helping Texans be better, smarter citizens. Congressman Beto O'Rourke, D-El Paso, speaks to a packed crowd at Scholz Garten on Saturday, April 1, 2017, in Austin, one day after he launched his 2018 Senate campaign. Photo by Laura Skelding for The Texas Tribune. See more photos on our Instagram account. "If the proposed budget cuts of $850,000 are realized, nearly 1,900 teachers each year will lose access to the professional development and training that enables them to teach AP courses." The Brief is written and compiled by your morning news baristas, Bobby Blanchard and Sanya Mansoor. If you have feedback or questions, please email thebrief@texastribune.org. As a nonprofit newsroom, we count on readers like you to help power newsletters like this. Did you like what you read today? Show your appreciation by becoming a member or making a donation today. The Brief: Senate committee takes up bills regarding eminent domain By Sanya Mansoor and Bobby Blanchard April 3, 2017 Editor's Note: If you'd like to get The Brief in your inbox every weekday, sign up here. Tribune today Texas lawmakers consider declaring fantasy sports legal&nbsp; In a hearing Monday, Texas lawmakers will weigh whether to proclaim fantasy sports are legal. This comes after Texas Attorney General Ken Paxton equated fantasy sports to illegal gambling. Analysis: At the Texas Capitol, a bill is merely dead, not sincerely dead&nbsp; You might rejoice or bewail the death of a piece of legislation, but remember this time-proven adage: Nothing is really dead while the Texas Legislature is still in Austin. Austin bar ends battle with TABC after agency returns crowler machine&nbsp; A local Austin coffee bar has been fighting the TABC since 2015 for the right to sell crowlers, aluminum cans filled with draft beer and sealed with a pull tab lid. Legislators are trying to prevent similar conflicts in the future. 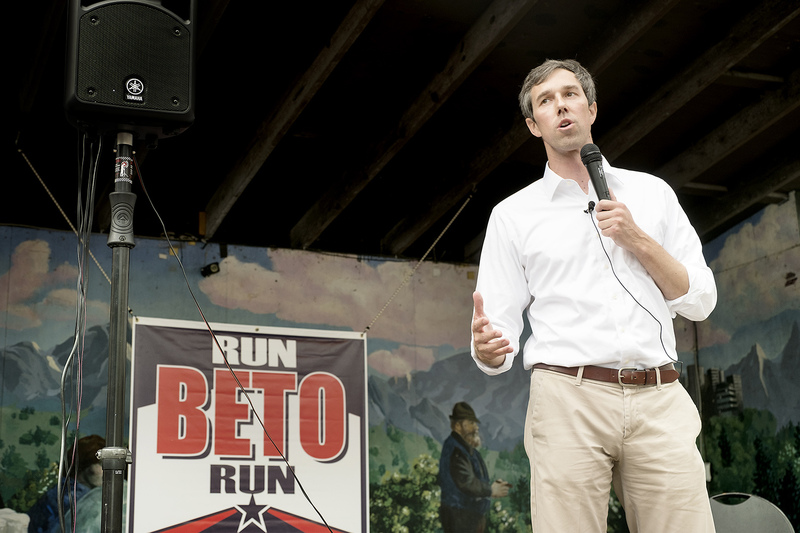 To beat Ted Cruz, Beto O'Rourke plans to throw out the Democratic playbook&nbsp; No Texas Democrat has won a U.S. Senate seat in nearly 30 years or any statewide office since 1994. But U.S. Rep. Beto O’Rourke is optimistic he can break the streak, in part by eschewing consultants, pollsters and PAC money. What you need to know The Senate State Affairs Committee is taking up several bills Monday concerning eminent domain. Some of the legislation is aimed at providing landowners with more information about their rights and how the eminent domain process works. On Wednesday, the Senate Transportation Committee will take up bills concerning one of the state's most controversial projects that relies on eminent domain: a high-speed train that would whisk Texans between Houston and Dallas in 90 minutes. Texas Central — the private company behind the project — has played down concerns about land ownership. They said they don't plan to use eminent domain except as a last resort. But the project has attracted the ire of some rural lawmakers, who have filed more than 20 bills aimed at it. The Texas Senate's proposed budget also features a rider that would limit state assistance to the projec The hearing begins at 9 a.m. Monday morning. Watch online here and follow Texas Tribune reporter Brandon Formby for updates. Other stories we're watching today: Texas lawmakers will weigh the legality of fantasy sports betting this afternoon. Watch online here and follow Texas Tribune reporter Alex Samuels for updates. The Texas Senate may take up legislation aimed at addressing the Dallas pensions crisis. Watch online here and follow Texas Tribune reporter Brandon Formby for updates. What we're reading (Links below lead to outside websites; paywall content noted with $) Q&A;: Lt. Gov. Dan Patrick says Texas must 'live within means,' The Monitor Walker County applies to house inmates with immigration detainers for feds, The Huntsville Item Is Beto O’Rourke On a ‘Suicide Mission’?, Texas Monthly A bus crash in God's country, San Antonio Express-News ($) Lawmakers to start debating special education bills Tuesday, Houston Chronicle ($) Serial Indifference: How the justice system failed Houston homeless women, Houston Chronicle ($) Gov. Greg Abbott's hard-line immigration stand could put more kids in foster care, The Dallas Morning News ($) Two foster teens bunking in Texas CPS office flee, are struck by vehicle; one dies, The Dallas Morning News ($) Mayor Mike Rawlings won't support bill to save Dallas Police and Fire Pension System, The Dallas Morning News ($) Amid legislative discord, Abbott predicts success, Austin American-Statesman ($) How Much People in the Trump Administration Are Worth, The New York Times ($) For your calendar Tomorrow, join us in person or online for a conversation on higher education in Texas with state Sen. Kel Seliger and state Rep. J.M. Lozano. Later in the day, we'll talk about legislative issues with experienced community organizers at the W Austin Records Room. The event is part of the Tribune's On the Record series, geared towards helping Texans be better, smarter citizens. Photo of the day Congressman Beto O'Rourke, D-El Paso, speaks to a packed crowd at Scholz Garten on Saturday, April 1, 2017, in Austin, one day after he launched his 2018 Senate campaign. Photo by Laura Skelding for The Texas Tribune. See more photos on our Instagram account. Quote to note "If the proposed budget cuts of $850,000 are realized, nearly 1,900 teachers each year will lose access to the professional development and training that enables them to teach AP courses." — Robert Scott, former Texas Commissioner of Education, about cuts to programs that support Advanced Placement via TribTalk The Brief is written and compiled by your morning news baristas, Bobby Blanchard and Sanya Mansoor. If you have feedback or questions, please email thebrief@texastribune.org. As a nonprofit newsroom, we count on readers like you to help power newsletters like this. Did you like what you read today? Show your appreciation by becoming a member or making a donation today. "The Brief: Senate committee takes up bills regarding eminent domain" was first published at by The Texas Tribune, a nonprofit, nonpartisan media organization that informs Texans — and engages with them — about public policy, politics, government and statewide issues. Link back to the original article, which is located at https://www.texastribune.org/2017/04/03/brief-senate-state-affairs-takes-bills-may-kill-bullet-train-proposal/.